Call of Champions is the mobile game I’m most excited to play when it finally goes public and worldwide. But for those who want a taste of the full thing, a closed beta has started up today, and I’ve gotten to play some of it. I’m fascinated by the mobile MOBA idea, mostly because I think it’s sometimes trying to fit a square peg into round hole. You can go for a traditional game in the genre, but then it’s a terrible fit for mobile. If you change too much, then it might not appeal to purists, but would fit better on the platform. 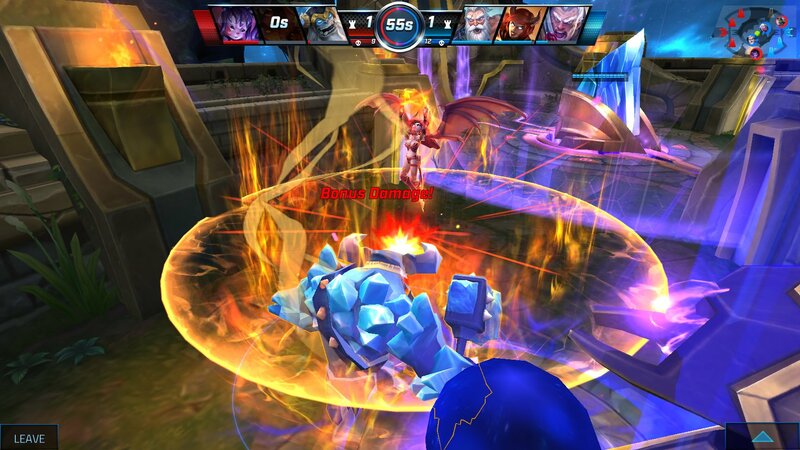 That’s what Spacetime Studios is doing with Call of Champions, and with a closed beta starting today that I’ve gotten to play with, I think they’re well on their way to at least making a really fun MOBA that’s also a really good mobile game. For those who didn’t read our GDC coverage, the game is a 3-on-3 MOBA that tosses out a lot of the aspects that complicate MOBAs. There’s no character leveling, no items, and no minions, even. 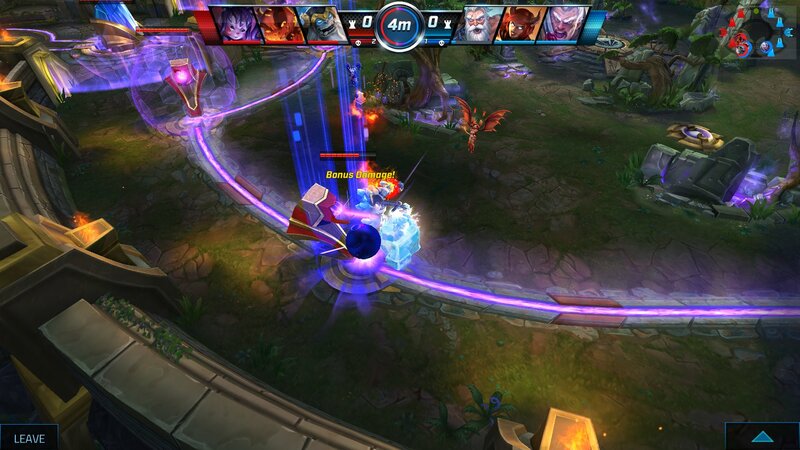 You and your teammates are trying to push orbs along the top and bottom lanes toward the enemy towers and base, with those orbs helping you to defeat the towers in each lane. There are powerups in the center of the map, which you can share with your team. Victories come by defeating the enemy base within 5 minutes. Otherwise, the team that took more towers wins, and if tower count is even, then the team with the most kills wins. And that all takes place within 5 minutes. You get your fully-powered character, and just go crazy. One of the things that impressed me is how easy it is to pick up on the game. I’ve played before, but only a couple of rounds a few months ago. I was paired up with Cinco Barnes of Spacetime Studios, and a fellow journalist who hadn’t played before, but was versed in MOBAs. And the newcomer seemed to pick up on the game in a flash, and we played several successful matches together. We had the benefit of being on a conference call together so we could voice chat, sure. The game’s small map makes it so that the most immediate concern is visible even if you don’t have voice communication. If you’re playing a character you don’t know, then you can tap and hold on abilities to see what they do, which comes in handy. The tutorial at the beginning helps out a lot. And unlike many tutorials, this is helpful to a genuine degree as it explains this game’s rules, and what you need to do, without taking up too much time. It’s not meant to make you feel like an idiot like many tutorials do. Plus, unlike something like Vainglory (Free), where you have to sit through lengthy tutorials before you can play for real, this fits well with the game. You spend maybe 5 minutes tops in the tutorial, and then you can play the real 5 minutes-long games. As far as monetization goes, it should be standard operating procedure for the genre. This means you can buy new characters, have a rotating selection of free heroes, and can unlock free characters by playing regularly. These purchases will all sync up cross-platform, too, as the game will be on iOS and Android. There’s a premium membership which gives you a bonus to your two currencies, allowing you to unlock new characters and their stat modifications in quicker order. That premium membership might be the way to go for a game like this – it’s the kind of thing where you can feel rewarded for supporting the game and playing a lot. No mobile MOBA has quite cracked the equation of how to make money, but honestly? If this one doesn’t, just in terms of the potential appeal and intelligence of this game, I don’t think any MOBA can do so on mobile. It’s just so much fun, because the matches get to the good part right away, and there’s always stakes. It’s something where I can see players becoming skilled at it, and using the eSports-friendly functionality like replays to study and get better. The replays are working, I don’t know if the streaming was working when I went hands-on, but it should be in at launch, for sure. I’m curious to see how the high-level play works, though I’ll never get to that level. But this is a game I’m so excited to have an audience, because I feel like this is a game I could get into and play often. The closed beta signups start now, with both iOS and Android betas available. I’m curious to see what a larger audience has to say about the game – I’ve had a ton of fun with it, but I’m not a MOBA expert. I’m fine with the mobile compromises. But will others find the benefits outweigh the drawbacks? We’ll see in the coming weeks and months as more people go hands-on with the game.